A week-long event took place along a stretch of coastline at St Athan, Wales, with a selection of drones being used in four different search and rescue scenarios to explore how they could be used to help save lives in the future. The scenarios being tested this week are a shoreline search for a casualty, an offshore search for multiple casualties in the sea, a mud rescue and a communications blackspot where a drone is required to relay information between rescue teams and a casualty on a cliff. These scenarios will evaluate the potential impact of using drones – also referred to as Unmanned Aerial Systems (UAS) – on operations. Particular attention will be paid to how drones can work together with existing search and rescue teams and assets, with RNLI lifeboats and an HM coastguard search and rescue helicopter featuring in this week’s rescue scenarios, to enhance lifesaving capability and reduce risk to rescue teams. Hannah Nobbs, from the RNLI’s innovation team, said: ‘The aim of this event is to provide realistic scenarios and an authentic operating environment to explore the use of drones in multi-agency operations. We hope this will allow us to understand the benefits and limitations of their use in search and rescue activity. ‘This week-long test event is the culmination of around two years of work, where we’ve explored the use of drones in collaboration with key search and rescue partners and industry experts. Phil Hanson, aviation technical assurance manager at the MCA, said: ‘The MCA is always ready to embrace working with new technology – especially if that technology could enhance search and rescue efficiency, save more lives and reduce risk to our personnel. ‘There is significant evidence emerging from our overseas counterparts and more locally from UK mountain rescue teams indicating that drones can play a crucial role in emergency response. With this in mind, we welcome the opportunity to take part in these emerging trials to test the viability of drone technology with other rescue resources. There are six different industry partners supporting the event, with these organisations supplying and operating the drones during the exercises. Participating industry partners include Lockheed Martin UK, Scisys and the university of Bath. 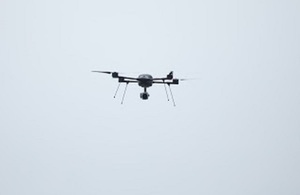 A variety of drones are being used in the scenarios, including rotary platforms that offer stability for electro-optic and thermal sensor payloads, a tethered drone and fixed wing platforms that are runway or catapult launched. The test ran from Monday 23 April to Friday 27 April.